Earlier today, House Republican Leader Kevin McCarthy (CA-23) and House Republicans stood with pro-life Americans at a press conference outside the Capitol ahead of Republican Whip Steve Scalise’s (LA-01) intent to file a discharge petition on the Born Alive Abortion Survivors Protection Act sponsored by Rep. Ann Wagner (MO-02). This legislation simply seeks to ensure babies born alive after surviving abortions receive the same level of care that any other newborn would. The discharge petition is in response to Democrat leadership blocking this bill from an up or down vote on the floor. “Today that all changes,” Leader McCarthy added, noting that Whip Scalise’s discharge petition simply needs the signatures of 218 members of Congress to bring the Born Alive Act to the floor for debate. The discharge petition, upon receiving 218 signatures, would prevent Democrats from again blocking the bill from reaching the floor. “Why would it have to come to this? Why would you have to do a discharge petition to save the life of a baby who survives an abortion?” Leader McCarthy asked. “I hope everyone who sits here and listens to this talk, I hope you move from here and ask every member of Congress: will they sign the petition? 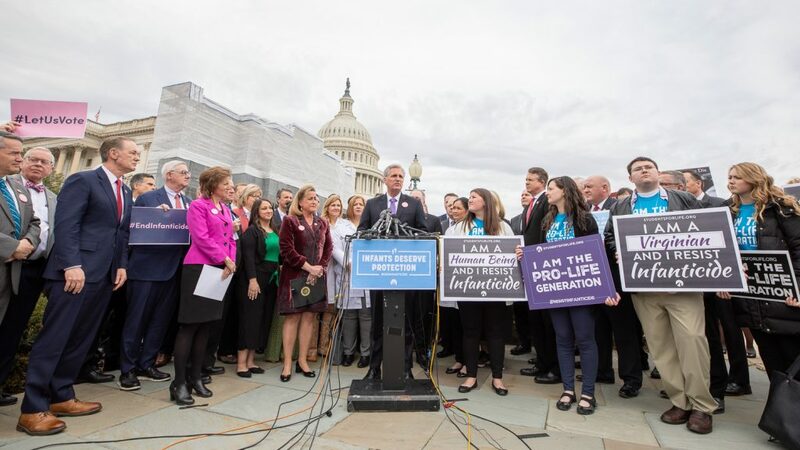 They got elected individually – not because the Speaker protected them from what they can and cannot vote for,” Leader McCarthy said, noting that the petition will put every elected member of Congress on the record on infanticide. Leader McCarthy was joined at the press conference by Republican Whip Steve Scalise (LA-01), Republican Conference Chairwoman Liz Cheney (WY-AL), Pro-Life Caucus Chair Chris Smith (NJ-04), House Values Action Team Chairwoman Vicky Hartzler (MO-04), Rep. Ann Wagner (MO-02), Congressman Dr. Phil Roe (TN-01), and Congressman Dr. Roger Marshall (KS-01). Both Roe and Marshall are OBGYNs. Special guests included Dr. Christina Francis, Chair of the Board of the American Association of Pro-life OB/GYNs, Melissa Ohden, founder of the Abortion Survivors Network, and Jill Stanek, a former RN from Illinois.